In 3 1/2- to 4-quart slow cooker, mix onion and bacon. Top with beef. Pour barbecue sauce over beef. Remove beef from cooker; place on cutting board. Cut beef into 1/2-inch pieces. Pour juices from cooker through strainer into small bowl, reserving onion, bacon and 1/2 cup juices. Return beef, onion, bacon and 1/2 cup juices to cooker. Stir in baked beans. Increase heat setting to High. Cover; cook 40 to 50 minutes or until thoroughly heated. 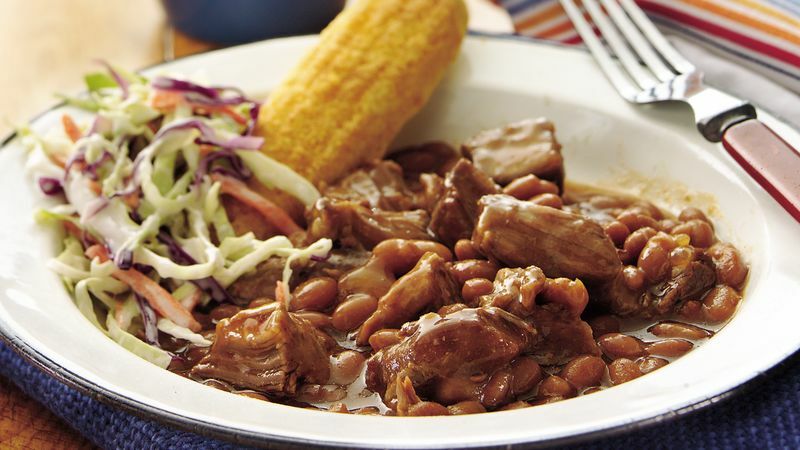 Be sure to use baked beans, not pork and beans in this recipe. Baked beans offer more flavor and are thicker than pork and beans.